I never really had a thing for apple pies or even any desserts made with apples. I would go for berries in a cake or in pastries, but apples? I guess it did not sound so appealing to me. I will just eat it plain. 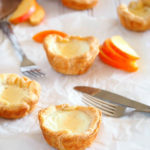 Until one day, one unforgettable bite of apple pie kinda’ swerved my stand for apples in pastries. When I was invited for a menu preview for Joey restaurants, me and other Winnipeg bloggers were served apple pie for dessert. Paired with vanilla ice cream, that first bite of the apple pie was something I can’t forget and I took a mental note that day that someday, I am gonna bake an apple pie. 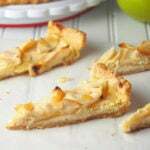 Or apple tart. Or apple turnovers. Or apple cake. In other words, I began to look at apples in a different light that day. So fast forward to now, here you are. And here I am. We have apple tart today. 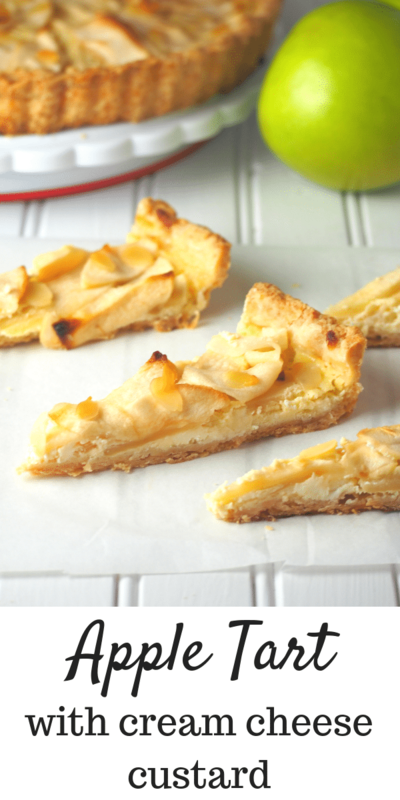 There is just this wonderful combination of the fruitiness of apple and the light, but creamy vanilla custard underneath that makes me want more and more of this apple tart. To start off, make the light and flaky crust. Whisk flour, sugar and salt in a bowl. Add the cubed butter and shortening. 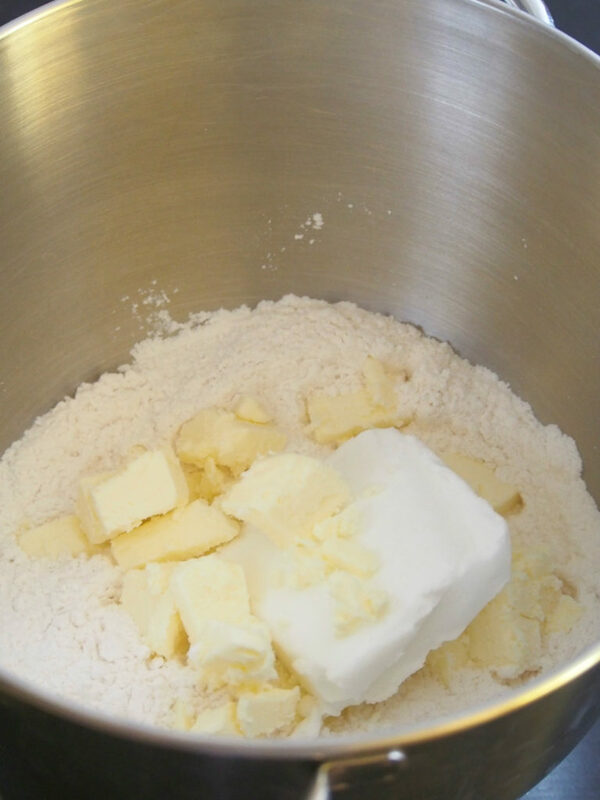 Use your fingers to rub the pieces of fat into the flour. Pinch, press, and smear. Repeat until you form a coarse and crumbly mixture. Be quick though. You don’t want the butter to get greasy on you. You can also use a pastry blender if you wish. Either way, be quick. Now add the water. Just sprinkle it evenly over the mixture and stir everything until the dough holds together when pressed. If not, add one to two tablespoons of water. Now gather and form the dough into a ball, then flatten it into a 6-inch disk. Wrap it in plastic and chill in the fridge for at least an hour. On a floured surface and with a floured rolling pin, Roll the dough into an approximately 13-inch circle. If you find that the dough is very sticky, lay a piece of plastic wrap and roll over the plastic with the dough underneath. Lift the dough gently by wrapping it into the rolling pin. Center it over an 11-inch tart pan with removable bottom. Ease the dough into the sides, pressing against the pan as you go. Cut the excess dough around the edges but leave about 1/4 inch overhang. Fold this excess dough inwards into the edges to strengthen the crust. Also, don’t let this dough break your heart. If it tears, simply pat the broken parts together with some scraps of dough. Or if it simply cannot be rolled as a whole, it helps to just flatten the dough in several portions into the pan and then press them up against the edges. It is normal and it is not a failure. This dough is tricky as it is beautiful in the end. And even if you get fingerprints on it, it would not matter. Chill the crust for about an hour in the fridge. Preheat oven to 375 F.
Prick several holes on the surface of the crust. Lay a parchment paper slightly bigger than the size of the pan over the crust and add a couple of handful uncooked rice or dried beans over it. 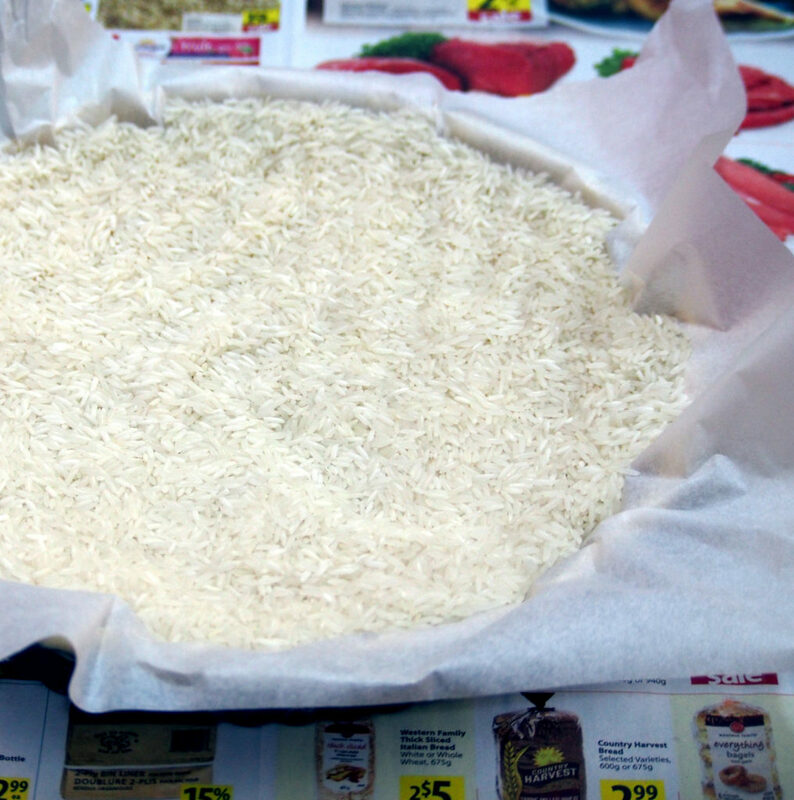 Make sure that the entire surface is covered with rice and that it extends up to the height of the crust. Bake at 375 F for 17-20 minutes. Carefully remove the parchment paper and bake for 5-7 minutes longer or until crust is lightly browned. Set aside to cool. At this point, you can now prepare the ingredients for the filling and toppings. Preheat oven to 375 F. Peel, core and slice the apples. Beat together the cream cheese, cream, eggs, vanilla, and sugar until smooth. In another large bowl, toss the apples, almonds, sugar, and cinnamon ( if using). 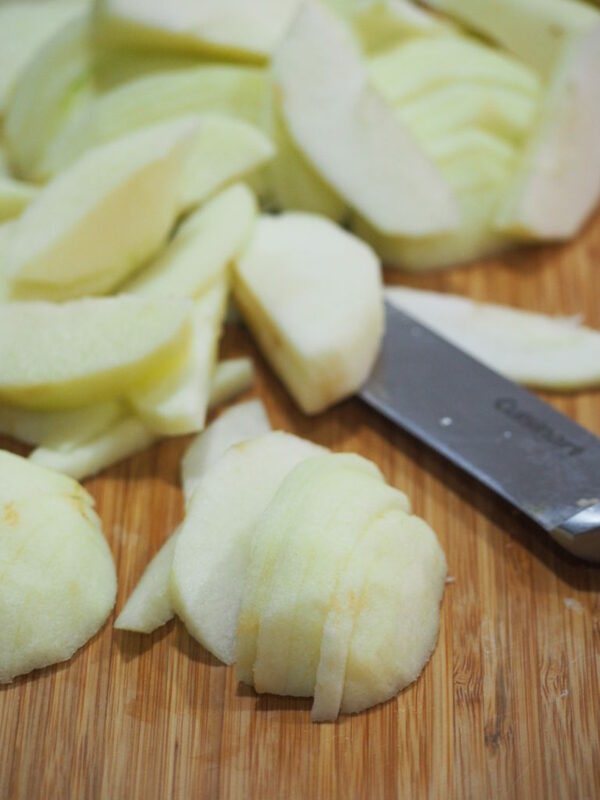 Once the oven reaches 375 F. Pour the filling into the crust, spread evenly and lay the apple slices on top. Scatter the almonds over the apples. 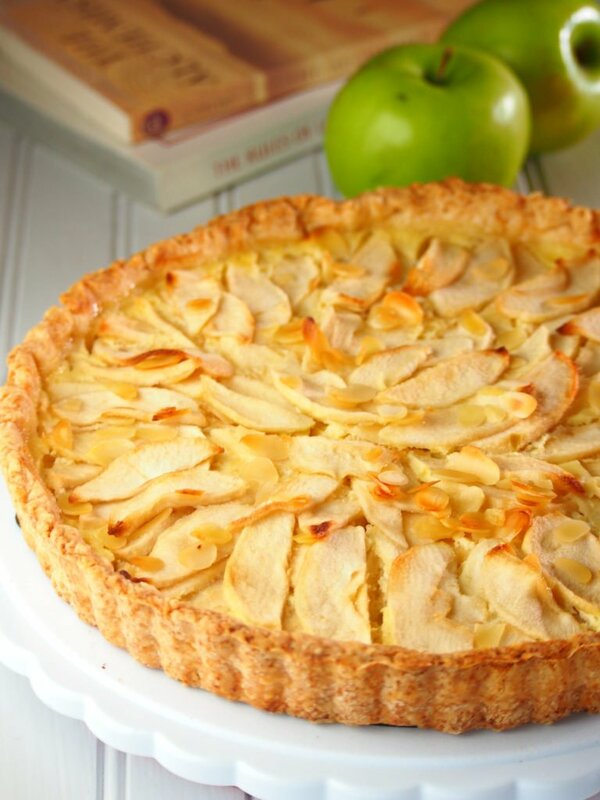 Bake apple tart for 30-35 minutes or until the apples are tender and lightly golden. This apple tart is heavenly on its own but if you feel like you need more indulgence, top it with a scoop of vanilla ice cream. That is my weekend goal. 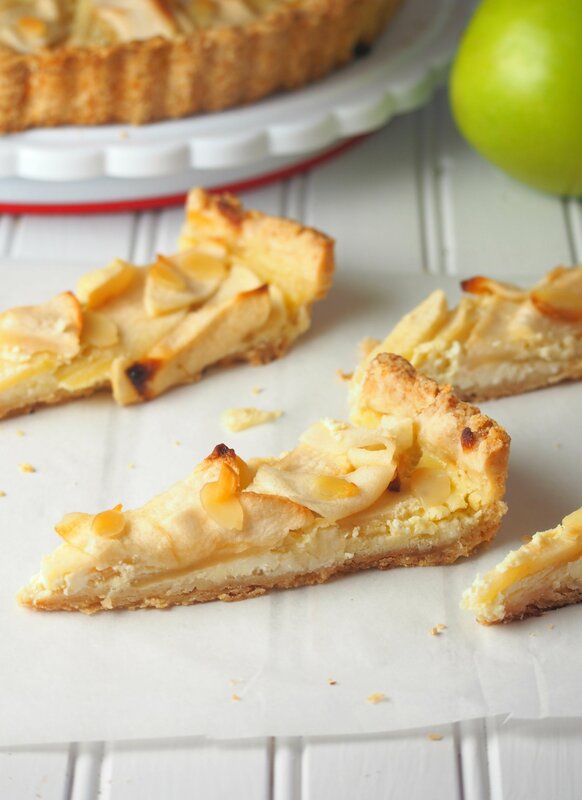 This Apple tart is a delightful dessert made with crisp apples arranged on a bed of vanilla cream cheese layer. In a large bowl, whisk together flour, salt and sugar. 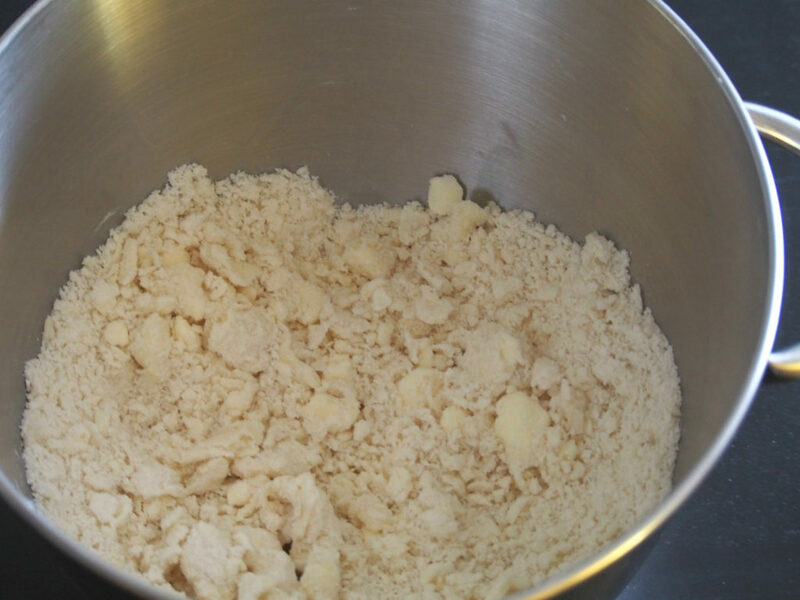 Add in the butter and shortening and using your fingers, rub the butter and shortening into the dry ingredients until the mixture looks like a coarse, crumbly meal with little lumps of butter ( you can also use a pastry blender). Drizzle 3 tbsp of water evenly over the mixture and gently stir everything with your fingertips or a fork. Pinch a portion of the mixture. If they come together when pressed, your dough is ready to be gathered. If not, add a tablespoon or two of water until the mixture is holding together when squeezed. Gather the dough into a ball, pressing it lightly with your palm just to keep them together. Pat the dough into a disk about 6-8 inches in size. Wrap it in plastic and chill in the fridge for at least one hour. On a floured surface and using a floured rolling pin, pat and roll the dough into a 13 inch circle. 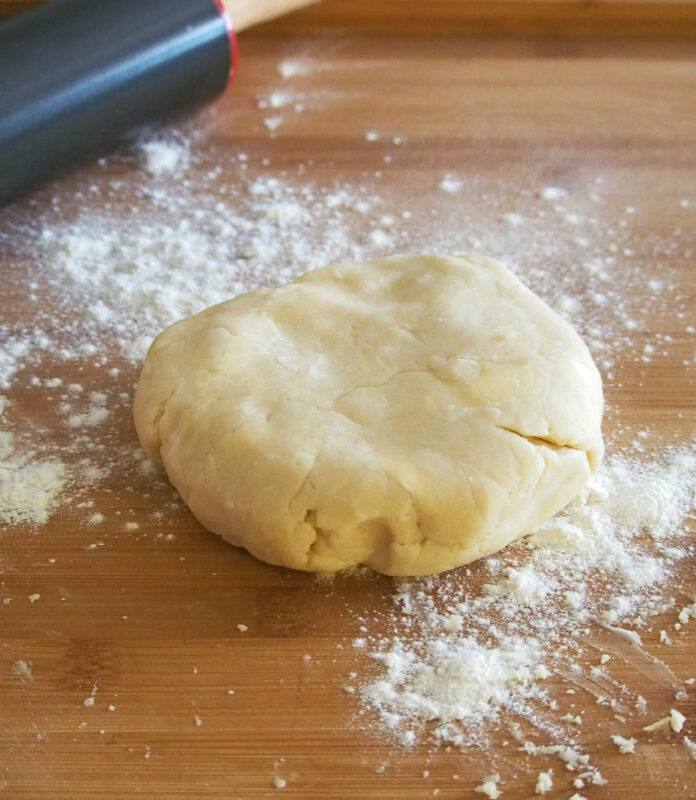 If the dough is too sticky, you can lay a plastic wrap on the surface of the dough and roll it with the rolling pin with the plastic wrap on top until you form a big circle. 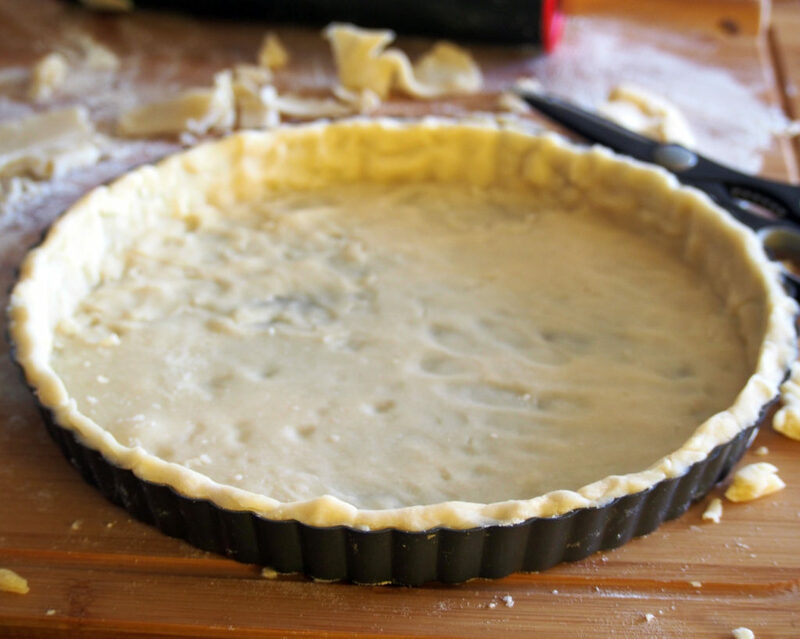 Remove the plastic wrap and lift the dough gently by wrapping it into the rolling pin and center it over an 11 inch tart pan with removable bottom. Ease the dough into the sides of the pan and cut the excess dough but leave about 1/4 inch overhang. Fold the excess dough inwards into the edges to strengthen the crust. Chill the crust in the fridge for 30 minutes to an hour. Note: This dough might tear a lot while rolling and shaping. 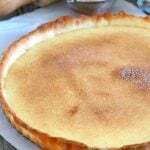 If that happens, you can just patch the broken parts together using scraps of the dough and also use your fingers to press and fit the dough into the tart pan. This dough can be pretty tricky to work with, but to patch and mend things together is easy. Be assured though that everything is worth it because the crust turns out beautifully flaky and light. Preheat oven to 375 F. Prick several holes in the surface of the crust with a fork. Lay a piece of parchment paper over the crust. The parchment should be slightly bigger than the tart pan. Put a handful of uncooked rice (or beans) on the parchment paper. Make sure the entire surface of the crust is covered with the rice and it goes all the way up to its height. Bake the crust for 17-20 minutes or until set. If you remove the pie weights too soon before the crust is set, the parchment will stick to the dough and the dough will tear. Make sure to let it bake for a good 17 to 20 minutes. Gently remove the parchment paper together with the pie weights and bake for another 5-7 minutes or until the crust is lightly browned. Set aside crust to cool completely. Preheat oven to 375 F. Beat together cream cheese, eggs, cream, vanilla and sugar until smooth. In a large bowl, toss the apples, sugar, cinnamon ( if using) and the almonds. Stir them with a fork until the sugar is distributed. 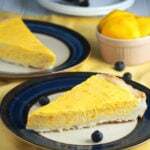 Once the oven reaches 375 F, pour the cream filling into the tart pan and spread evenly. Arrange the apple slices on top and sprinkle the almonds over them. Bake until the apples are tender and lightly golden, about 30-35 minutes. May I know how many gm is 1 stick of unsalted butter? Hello Ly! It is 113 grams for 1 stick of unsalted butter. Enjoy! I made this over a period of 3 days…made the dough then had it in the fridge overnight. Baked the crust the next day and let that sit for a night. Today I finally finished it off! It is REALLY good!! 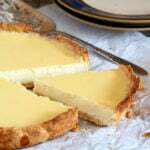 The dough is definitely more like a shortbread instead of a typical pie/tart dough. I couldn’t roll it at all! I just put it in the pan and had to shape it in with my hands. And it cracked in a few spots while baking. But once it was filled and baked, the cracks don’t matter! I will definitely be making this again! Hello Audra! I am so happy that you liked it! This is one of my favorite and I couldn’t resist making it over and over again!